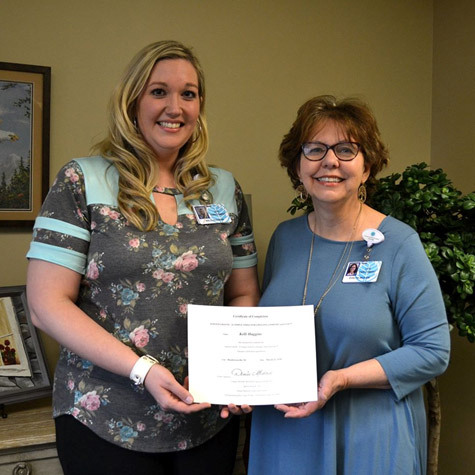 Grace Ridge Staff Recertified as Ageless Grace Instructors - Grace Ridge Retirement Community - Morganton, N.C.
Press Release: Grace Ridge Retirement Community has recertified staff members, Kelli Harris Huggins and Evelyn Beaver, as Ageless Grace instructors. Designed for healthy longevity of the body and brain, Ageless Grace is a fitness program that combines research from areas of medicine, neuroscience, physical therapy, martial arts and fitness. Grace Ridge is one of the few senior living communities in North Carolina, and the United States, with certified instructors. Juicy Joints, Gentle Geometry, Rockin’ Rockettes and Spaghetti Spine are examples of the anything but ordinary exercise classes offered under this unique fitness program. The program’s 21 tools (movements) are based primarily on the science of neuroplasticity to help stimulate different areas of the brain: analytical, strategic, kinesthetic learning, memory/recall, creativity and imagination. “This program is one of the many ways our residents have fun and stay healthy with our Good Moods and Well4Life programs,” says Kelli Harris Huggins, wellness coordinator, Grace Ridge. The Ageless Grace program was founded and created by Denise Medved, a leader in the fitness world and trainer for movement modalities for the last 27 years. The program is offered in other retirement communities around the U.S.; specifically in Texas, New Jersey, Connecticut, Colorado, Oklahoma, Massachusetts and Florida. This program is just another way Grace Ridge residents are staying active and vibrant while having fun. Kelli Harris Huggins, Grace Ridge Wellness Coordinator, and Evelyn Beaver, Grace Ridge Director of Life Enrichment, with their Ageless Grace certification.